The banana and chocolate flavors are very good. The two flavors feel distinct, yet they play off of one another - supporting each other - like friends. When toasted, the chocolate reminds me of a hot fudge topping you might put on a banana split. At first taste, the banana flavor seems remarkably authentic. However by the end of my second pastry, that banana flavor was coming across as more artificial. If you eat them in single-pastry portions (as recommended), this shouldn't present a problem. This is a Pop-Tart for people with a sweet tooth as it is most definitely very sweet. 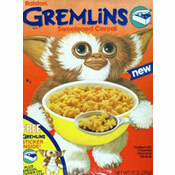 It will leave a mild, sugary after-taste in your mouth. My sister, aka Sister Breakfast, pointed out to me that the Banana Split name is a little misleading. Traditionally, a banana spit would also include a berry element such as a strawberry topping. We both mused about the possibilities of adding such a flavor. If you like sweet toaster pastries and chocolate and banana are flavors you generally enjoy, you should really give this product a try. Nutritional considerations: Each single pastry serving has 200 calories, 2 grams of saturated fat, 0 grams trans fat, 35 grams of total carbs, less than 1 gram dietary fiber, 17 grams of sugars and 2 grams of protein. The smattering of vitamins and minerals is minimal. Mr Breakfast recommends: Due to this products lackluster nutritional profile, eat these as a snack or as a special no-more-than-once-a-week breakfast if you've had healthier breakfasts most other days of the week. 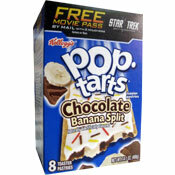 What do you think of Chocolate Banana Split Pop-Tarts? I wholeheartedly agree with your assessment. These were very sweet and need something to counteract it. Interesting idea about putting in a stripe of strawberry to make it a "true" banana split. Which begs the question, "Why isn't there a pineapple pop-tart?"